224 changes each Ashtead, Bristol, Cambridge, Cassiobury, Cornwall, Cray, Double Dublin, Glasgow, Ipswich, Jersey, Lincolnshire, Lindum, London, Preston, Pudsey, Rutland, Superlative, Tavistock, Uxbridge, Watford, Wembley, Whalley, Yorkshire; 160 changes of method; all the work. First Peal of 23 spliced - 5. To Congratulate Thomas F Metcalfe of Kirkby-in-Furness on being awarded the MBE. Last updated Sunday, 18 February 2018 at 18:55:47. First submitted Sunday, 14 January 2018 at 21:22:14 by Patrick L H Brooke. 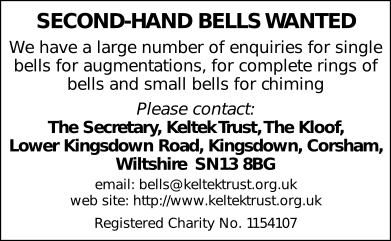 Sent for publication in The Ringing World on Friday, 16 February 2018 at 14:40:52, and printed in issue 5575, page 202. This performance has been viewed 983 times.